clear evidence that upright walking preceded big brains. Other bipeds placed on the evolutionary “main line” heading for humanity included a succession of bigger-bodied, larger-brained, smaller-faced forms, including Australopithecus africanus, Homo habilis, and Homo erectus. This sequence also represented a geologic series from oldest to youngest. Put a chimp at one end and a human at the other, and there before you was the classic conga-line progression from stooped-over ape to upright human, with the man (it was always a man) striding boldly into the future. To be fair, we students also learned about a few hominin offshoots from the main line—among them a pair of super-robust australopiths in Africa and the Neanderthals in Europe—but these creatures were clearly evolutionary dead-ends. The story’s central plot was simple and straightforward, heading in a bee-line for the pinnacle of creation. Ah, those were the days. Back in the 80’s, you could have fit almost all known early hominin fossils from Africa onto a large table or two. But times have changed. Thanks to the dogged efforts of insightful scientists and keen fossil-finders, the past quarter century has witnessed a startling series of discoveries and insights in paleoanthropology. The bounty of recently unearthed fossils, coupled with revelations from the world of genetics, have dramatically fleshed out the human evolutionary story, and greatly complicated it as well. Umpteen new characters have been added to the dramatis personae, with the total number of hominin species now varying somewhere between 15 and 25, depending on whose counting. Key metaphors have been swapped out too. The traditional evolutionary ladder with Homo sapiens sitting on the uppermost rung has morphed into an arborescent family tree, each branch occupied by a different long lost cousin. If we are to understand our relationship with nature, we must know something of the human journey, which is but one chapter in a much longer cosmic journey. 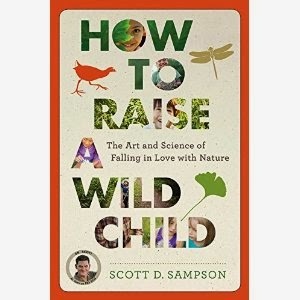 How we conceive of humanity’s emerging cannot help but shape our views of the natural world. In a series of three posts, I will offer a synopsis of this 6 million year epic drama in three acts, each spanning roughly 2 million years. For the beginning of the story—your story—I have chosen a pivotal event that took place sometime between 5 million and 7 million years ago: the splitting of the human and chimpanzee lineages. One of these lines would culminate in the present day with relict populations totaling about 100,000 animals, all restricted to a few patches of West African forest. The other would wind up tracing the rise of a globally dominant species numbering more than 7 billion. Had you been present to witness this consequential parting of ways, it’s highly doubtful that you would have discerned any hint of such divergent futures. Those signs would come later, as evolution gradually molded the raw materials of our ancestors into a new kind of animal. So what happened? Given our shared heritage, why didn’t chimps take over the world instead of us? Answering that question is our critical task. AS THE TIME machine sets us down in Act 1, we find ourselves immersed in a savannah-like scene in northeast Africa during the early Pliocene Epoch, about four and half million years ago. From the vantage of a circling eagle, we see a patchwork of grasslands and forest. A river with thickly wooded borders snakes lazily through the landscape, emptying into a nearby lake where catfish congregate in the depths, hippos and crocodiles lounge near the shore, and an impala herd pauses to drink. Zooming down for a closer look, we find a rhino mother and calf browsing a woodland margin. A startled family of guineafowl scurries into the underbrush. Not far off, a kudu male with august, spiraling horns plucks leafy foliage, keeping a watchful eye on his “harem,” while a giant tortoise plods along with his own reptilian concerns. Stepping into a forest patch, we enter another world, full of greenery, shadow, and birdsong. Sweltering grasslands are exchanged for a cool canopy of hackberry, palm, and fig trees. Colorful parrots and peafowl abound, accompanied by doves, lovebirds, swifts, and an occasional barn owl (minus the barn, of course). The litter of the forest floor hosts a profusion of dung beetles, snails, millipedes, and other creepy crawlies. You catch brief glimpses of lizards and rodents. A loud roaring overhead marks the arrival of a colobus monkey troop, evidently pleased to take a hiatus from leaf-eating to consume some sumptuous figs. A nearby squirrel, unhappy about the primate interlopers, chatters his objections. Although the vast majority of species here are distinct from those living today, the characters seem very familiar. But then the rowdy colobus begin a new call, one that sounds more like an alarm. You look up to see the monkeys abruptly abandon their meal and make a rapid arboreal retreat. Moments later another hooting primate arrives. Instead of monkeys, these agile, ape-like creatures are much larger, about the size of chimpanzees yet distinctly different. Two adults move through the tree canopy on all fours, running along branches with grasping hands and feet. Four more individuals, among them a pair of juveniles, arrive on foot—two feet to be precise. They are walking upright, but with a strange gait, waddling side to side like John Wayne inflicted with serious saddle sores. Hanging by their sides are exceptionally long arms terminating in oversized, flexible hands. Now at the base of the fig tree, the animals climb with powerful, deliberate movements, more like tree sloths than colobus monkeys. Finally, the group gathers high in the canopy to feast on the ripe fruit. Watching them eat, you note that the largest individual, a male, lacks the long, dagger-like canines typical of chimps and gorillas. What is this creature? seemingly with one foot planted in the ape camp and the other in the human camp. In fact, Ardi’s foot is one of the best examples of this “split personality,” with the big toe directed sideways, able to grasp tree branches like an ape, and the remainder of the foot bones stiff and forward facing, well suited (at least to the eyes of some experts) to upright walking. The pelvis of Ardipithecus is similarly schizophrenic, with a flared upper portion adapted for two-legged walking and a deep lower portion suggestive of powerful climbing muscles. The brain was slightly larger than a chimp’s, and about 20% the size of a human brain. The size and shape of the teeth point to an omnivorous diet of plants, fruits, nuts, and tubers, perhaps supplemented by such delicacies as small mammals, bird eggs, and insects. Ardi’s fragmentary fossils have even been used to infer social behavior. Whereas chimp males use their oversized canines to compete aggressively for females, Ardipithecus males had small canines equivalent to those of females, suggesting to some investigators that males exhibited much less aggression toward one another. Perhaps, they argue, Ardipithecus couples formed long-term pair bonds, as humans do, an innovation that would have cascading effects down the hominin line. At first glance, Ardi seems to be the perfect “missing link,” part ape and part human. But the notion of missing links turns out to be outdated, misguided, and, well, just plain wrong. First, and most trivially, animals like Ardipithecus clearly are not missing, but found. Second, such transitional animals are not links, a metaphor of progress closely allied with ladder rungs. Instead, such creatures are better regarded as mid-level branches that help us fill out the human family tree. Finally, although chimpanzees may be our closest living relatives, Ardi makes it clear that our last common ancestor with them differed markedly from Jane Goodall’s most beloved primate. Gorillas and chimps both walk on the knuckles of their hands, so it’s long been thought that we humans must have passed through a knuckle-walking phase on our way to becoming bipedal. Yet Ardi lacks the stiffened hands seen in knuckle-walkers, and evidently walked on her substantial palms instead. 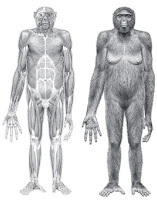 Similarly, Ardipithecus doesn’t have the specialized arm and shoulder anatomy of our closest living ape cousins, suggesting that tree-swinging evolved in the chimp lineage sometime after the split with our ancestors. The feet too are informative. Chimpanzees are adept tree climbers in part because they lack a specialized foot bone, allowing their flexible feet to grasp branches when aloft. But that same flexibility hinders their ability to walk upright. Like us, Ardi possesses the key foot bone, suggesting that this element was lost in the chimp line sometime after the “great branching event.” In short, we didn’t evolve from chimpanzees. Far from being “primitive” or “backward,” our closest ape cousins, with whom we share more than 98% of our genes, have been on their own journey since we last parted ways in some ancient African forest. In all, Ardi was a unique creature with a switch-hitting lifestyle, splitting her time between the ground and the trees, but likely more at home in the latter. Bipedalism, rather than offering views over tall grass or freeing the hands for tool use, may have evolved initially as a way to get around in a mixed habitat, walking upright on the ground and moving on all fours while up in the trees. 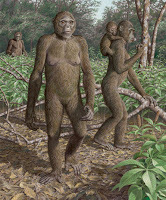 As befits any arbor-loving species, Ardipithecus appears to have inhabited woodland settings, an ecological interpretation bolstered by the abundance of forest-living organisms found in the same sediments (a list that includes, by they way, all the plants and animals mentioned in our time-traveling scenario). Grasslands had been expanding in Africa for millions of years in response to a long-term trend toward drier, more seasonal climates. Yet plenty of forest patches persisted, more than enough to sustain Ardi and her kin . Ardipithecus is not the only fossil representative from this earliest phase of hominin evolution. Recent discoveries of two other fossil forms, Sahelanthropus tchadensis from Chad and Orrorin tugenensis from Kenya, offer additional tantalizing clues of the chimp-human split . But Ardi provides the only substantial illumination of the human journey’s first act. My strong hunch is that we’ll ultimately discover a diverse tribe of Ardipithecus-like hominins that lived between 7 million and 5 million years ago. Why? Because so little is known from this time interval and, as we shall see in the next post, experience gleaned from explorations into subsequent acts of this drama reveal an African continent populated by unexpected clans of upright cousins. Stay tuned. 1. The terminology applied to our nearest evolutionary relatives has changed over time. Back in the 1980’s, the word “hominid” referred only to humans and their bipedal relatives. More recently, the close genetic relationship that we share with chimpanzees and other apes has prompted a shift in terms. Today, the word “hominid” refers to the larger family of primates that includes all great apes and humans, together with their last common ancestor and all extinct members of this group. In its place, the word “hominin” is now commonly used to denote humans and other bipedal apes, including Ardipithecus, Australopithecus, Paranthropus, and extinct species of Homo. 3. 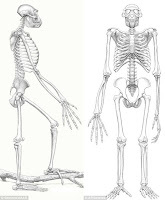 Not all investigators are convinced that Ardipithecus inhabited a forest setting. A study by Thure Cerling (University of Utah) and colleagues presents evidence that forests were largely limited to the banks of rivers and that grasslands were abundant even then. Tim White (University of California, Berkeley) and his team have responded by arguing, convincingly I believe, that, although grasslands were certainly present, the weight of evidence points to a forest habitat for Ardi. Cerling, T. E., Levin, N. E., Quade, J., Wynn, J. G., Fox, D. L., Kingston, J. D., Klein, R. G., and Brown, F. H. 2010. Comment on the paleoenvronment of Ardipithecus ramidus. Science, 328(1105): doi: 10.1126/science.1185274; White, T. D., Ambrose, S. H., Suwa, G. and WoldeGabriel, G. 2010. Response to comment on the paleoenvironment of Ardipithecus ramidus. Science, 328(1105: doi: 10.1126/science.1185466. 4. Brunet M. et al. 2002. A new hominid from the Upper Miocene of Chad, Central Africa. Nature, 418:145-151; Senut, B., Pickford, M., Gommery, D., Mein, P., Cheboi, K., Coppens, Y. 2001. First hominid from the Miocene (Lukeino Formation, Kenya). Comptes Rendus de l'Academie des Sciences, Series IIA - Earth and Planetary Science 332(2):137-144.